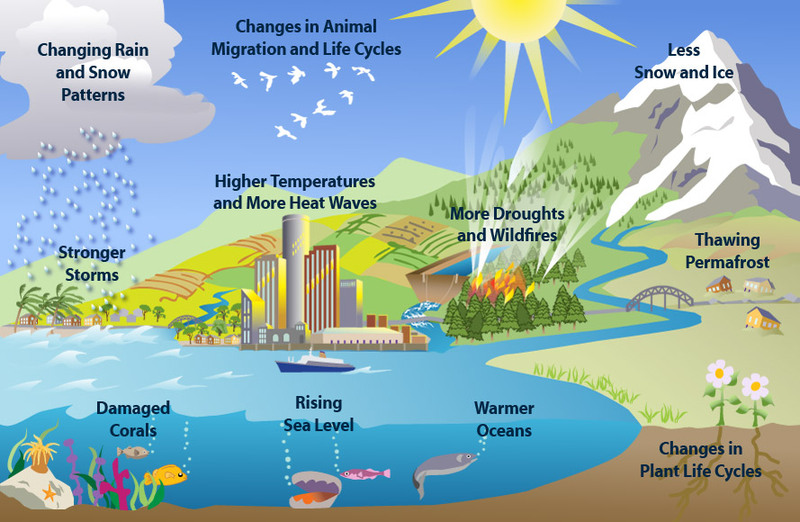 Home Climate What is Climate Change? When considering the meaning of the expression “Climate Change” the first thing to remember is that weather and climate are not the same thing. Weather by its very nature refers to short term events which can be very changeable but climate refers to an appraisal of the average meteorological conditions over an extended period and is normally regarded as being fairly stable for any location. As an example, the UK’s climate is described as being “Temperate Marine” and is influenced by many factors including latitude, the warming effects of ocean currents and the influence of various air masses from the tropics, the northern polar region and continental Europe. Climate change has always happened but changes have usually taken place over an extended timeframe such as the succession of regular ice-ages which closely correlate with shifts in the Earth’s polar axis. However, today’s great concerns about climate change are quite different and centre on the fact that the Earth’s average temperature has begun rising at an unprecedented rate with potentially catastrophic consequences. Climate change has always happened but changes have usually taken place over an extended timeframe such as the succession of regular ice-ages which closely correlate with shifts in the Earth’s polar axis. However, today’s great concerns about climate change are quite different and centre on the fact that the Earth’s average temperature has begun rising at an unprecedented rate with potentially catastrophic consequences. It is now almost universally accepted that climate change is a real phenomenon rather than an academic hypothesis and the usual cause is given is the increase of greenhouse gasses in the atmosphere leading to excessive warming. Greenhouse gasses are of course an essential part of the atmosphere and without them the planet would be unable to sustain life but the levels of these gasses have greatly increased in recent years most probably due to human activity. In a natural state, the atmospheric gasses are constantly changing with some being removed as others appear resulting in a delicate balancing act but the balance now seem to have been disturbed leading to a steady increase in these gasses. An analogy could be the collection of rain in bucket with a hole in it. As long as the water flows out of the hole at the same rate that the rain enters the bucket, the water level will remain constant but in a downpour the level will continue to rise. There are various greenhouse gasses including water vapour, nitrous oxide, methane, ozone and carbon dioxide plus several others. Human activity has resulted in increases in many of these and the Earth’s natural ability to recapture them has simply not been able to keep pace with these increases. Carbon is often cited as being the primary offender and the use of fossil fuels has resulted in the release of carbon which had been safely locked away for millions of years but deforestation is also part of the carbon problem as this not only releases huge amounts of carbon but also reduces the number of trees which have incredible carbon capture abilities. Methane is another manmade problem with some originating from the oil and gas industry and some from the raising of food animals. Methane of animal origin is continuing to rise in line with meat consumption and population increase. An average temperature change of just a few degrees may not sound like much of a problem but it should be remembered that the last ice-age followed a temperature drop of only around four degrees compared to today resulting in some northern regions being covered in ice a mile thick. The effects of a temperature increase by a similar amount are very much an unknown quantity but its seriousness cannot be underestimated. It is very easy to try to blame others for the problems of climate change but the uncomfortable truth is that we must all accept responsibility. Excessive use of fossil fuels occurs throughout the developed world but, on an individual basis, anyone who drives a large engine car, takes air flights or eats meat is a major contributor to the problem and we should all be aiming towards leading a less damaging lifestyle checking the green credentials of everything we do or buy. Climate change is real and is happening now. Even if we completely stopped all use of fossil fuels today the problem would still take decades for the natural balance of greenhouse gasses to be restored. We can of course take steps to put things right for future generations but there is not a moment to lose. The immediate effects of climate change are already being seen with changes in weather patterns, increased storms and flooding. On a global level, The Arctic sea ice is reducing and although this will not have any effect on sea levels, just as a melting ice cube in a glass of water does not raise the water level, melting ice sheets in Greenland and Antarctica most definitely will raise sea levels. This will make some low-lying areas more susceptible to flooding. Increased acidity of the world’s oceans could have a devastating effect on marine life especially the fragile coral eco-systems but also affecting all shell forming species. Changing weather patterns will also affect the growing of crops with more frequent storms, unpredictable rainfall and temperature changes. Species extinction is already occurring at a much higher than normal rate and changing climatic conditions are likely to accelerate this even further. It is likely that some parts of the world may become uninhabitable leading to mass migration and social upheaval. There could even be famines, plagues and pestilence of biblical proportions. None of us has a crystal ball and so any predictions can only be based on the best scientific data available coupled with an appreciation of statistical probabilities and a little bit of imagination. The optimists may put forward a best case scenario for the UK suggesting that the weather may become rather unpredictable but the UK climate may become rather more Mediterranean in character with crop growing boundaries moving further north so we may yet see hops being grown in Huddersfield and olive groves in Aberdeen. The pessimists on the other hand warn that major changes could cause disruptions to the climate forming infrastructure putting forward a scenario where melting polar ice could disrupt ocean currents such as the Gulf Stream and North Atlantic Drift plunging the UK into the icy temperatures that its northerly latitude would merit. The truth is that, when it comes to the future of our climate, no one really knows. It is probably a safe assumption that a few thousand years hence the planet will once again be gripped by another ice-age but as for the immediate future we are sailing in uncharted waters. Positive intervention to switch to nonpolluting energy sources and modification of farming practices may help to slow the rate of change but there is no getting away from the fact that climate change is here and the effects are without doubt going to become more widespread before there is any likelihood of improvement. Never in the history of mankind has any attempt been made to manipulate the chemical makeup of the atmosphere. The methods to combat this threat are available but need the combined co-operation of everyone on Earth and that unfortunately is far from likely. So climate change is real, happening now and possibly has dire consequences. Even the experts cannot offer any real advice regarding its likely effects and is seems that the only thing that can be accurately predicted about climate change is its unpredictability. Previous articleAre greenhouses good or bad for the environment? Next articleWhat does eco-friendly mean? In the US we need to get on board with the rest of the world. Look at all the wildfires and increased desertification of our country. We can all feel that each year it get hotter and mostly drier. By 2100 the summer temperature in Houston is projected to increase from 91f (32.7c) to 100f (37.9c) – we have to do something about it and our joke of a president is going to set us back years.